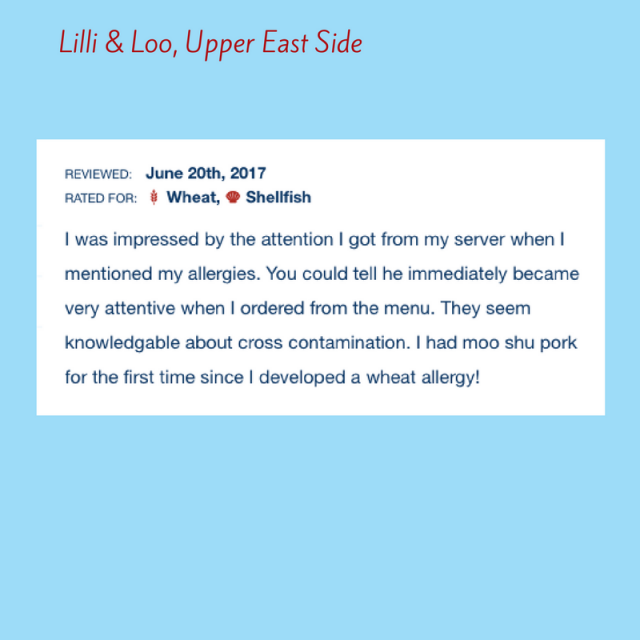 Choosing the best place to dine in New York City can be overwhelming, so we’ve put together a list of allergy-friendly restaurants based on AllergyEats’ user reviews near attractions in four areas: Midtown/Times Square, Midtown South, Downtown/World Trade Center and Uptown. In Midtown/Times Square, indicated here as the area between 34th and 59th Streets, famous landmarks include Times Square, Rockefeller Center, Bryant Park, the Theater District and elegant Fifth Avenue. 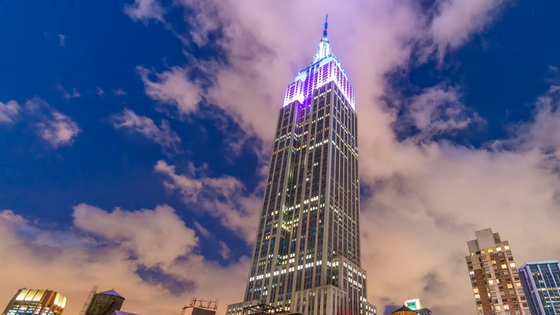 Midtown South, indicated here as the area between 14th and 34th Streets, is where you’ll find noteworthy destinations including Penn Station, Madison Square Garden, the Empire State Building and Herald Square. 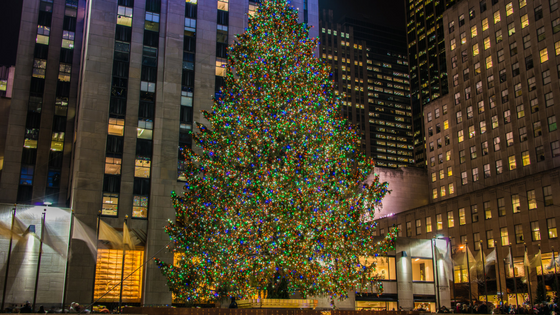 ‘Tis the season for classic films like Miracle on 34th Street, and if you’re lucky enough to visit New York City over the holidays, we imagine that a visit to the movie’s featured retailer, Macy’s in Herald Square (34th and 35th Streets at Seventh Avenue and Broadway), might be on your list of things to do. After strolling by the store’s holiday windows, visiting its Santaland, or just seeing the site of the famous Thanksgiving Day Parade, you can venture over to two different allergy-friendly restaurants within minutes: Blue Smoke for upscale BBQ or Bistango for Italian cuisine. 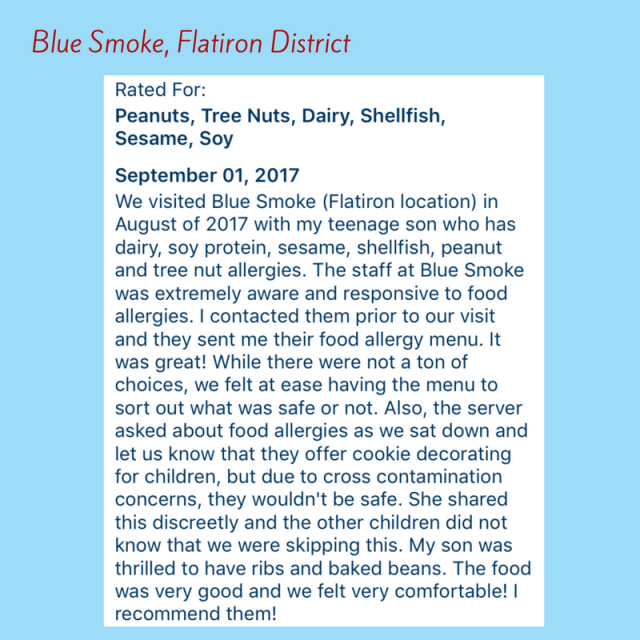 Both restaurants have been spotlighted before on the AllergyEats blog, based on our team’s personal experiences: Blue Smoke in NYC is Smokin’ Good with Food Allergies and Amazingly Easy Food Allergy Dining Experience in NYC. Bistango may sound familiar as its sister restaurant was recently mentioned as one of AllergyEats’ top-rated restaurants in the Times Square area. (Blue Smoke also has a second location, closer to downtown.) In case you are in need of a bite to eat before leaving the city on Amtrak, these restaurants are about a 10 to 15 minute cab ride to Pennsylvania Station (31st to 33rd Streets between Seventh and Eighth Avenues.) Sports fans take note – Madison Square Garden, home to the New York Rangers and the New York Knicks, sits atop Penn Station. We recognize that so many food allergy articles these days focus on children with food allergies, and it’s important to point out that there’s a growing population of adults with food allergies, too! With that in mind, Del Posto is a good choice for food-allergic diners seeking upscale dining in New York City. The Relais & Chateaux recognized restaurant is known for its prix fixe menu, though a la carte options are available, and it discourages guests under the age of 6. Del Posto is just steps from the High Line if you’d like to capture some unique (dare we say, romantic?) views of the city from 30 feet above street level before or after dinner. Another fun stop in the area is Chelsea Market, largely an indoor food hall, but also a marketplace featuring locally made art, jewelry and other goods. All of this sounds like a great date, no matter what time of year, for the food-allergic adults in our community! Important landmarks below 14th Street include the 9/11 Memorial, Statue of Liberty, Wall Street and SoHo. 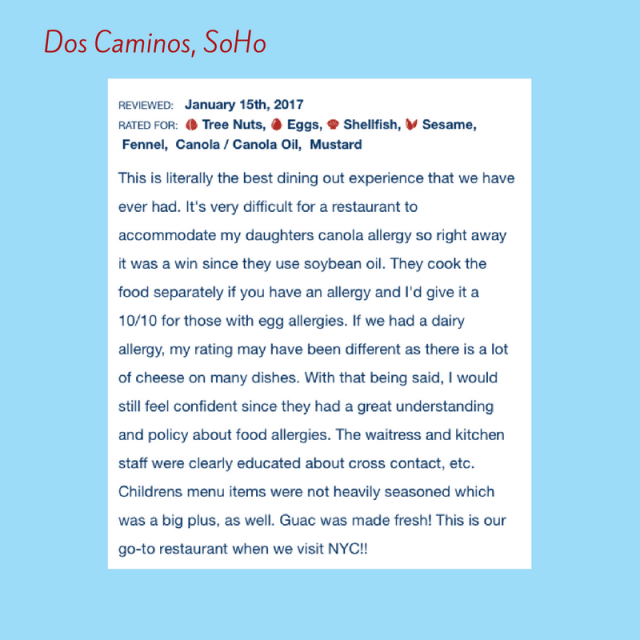 If the prospect of seeing celebrities in fashionable SoHo is part of your plans while in New York City, there’s a highly rated Dos Caminos in the midst of the neighborhood’s many art galleries and boutiques. 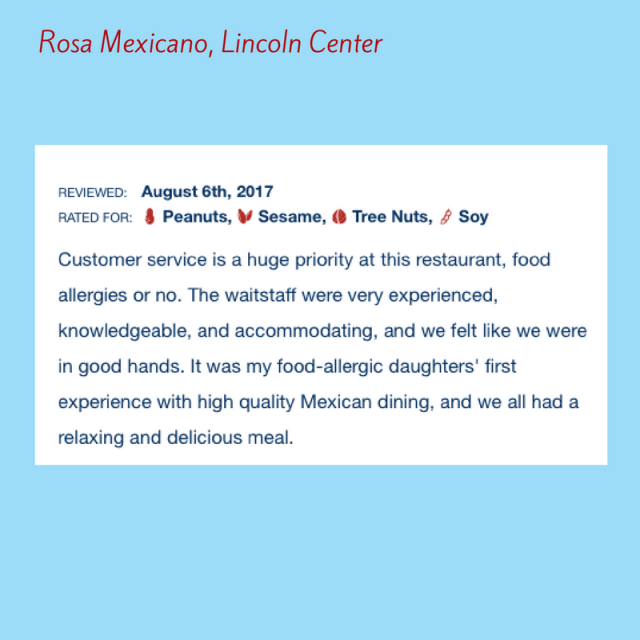 The purveyor of Mexican cuisine has five locations in Manhattan, two of which are highlighted in our recent blog about dining out with food allergies in the Midtown/Times Square area, and this location is equally well-regarded with its 4.6 rating on AllergyEats. 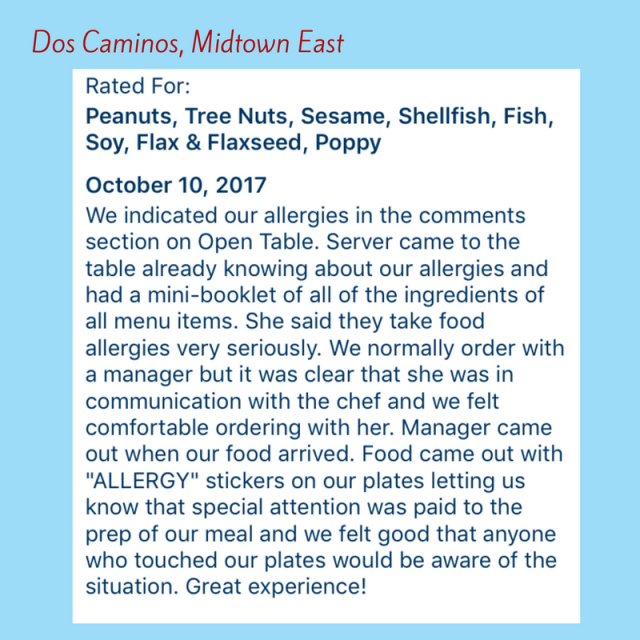 Dos Caminos is also AllergyEats’ closest allergy-friendly restaurant to the 9/11 Memorial & Museum and the Statue of Liberty. 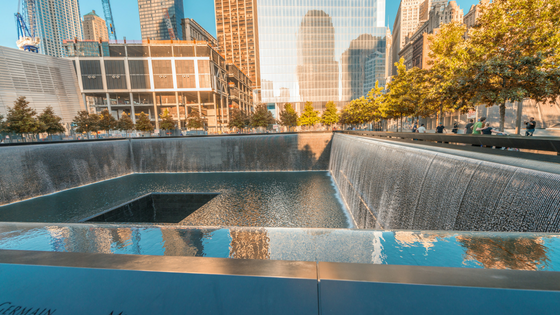 Many tourists choose to pay their respects to those fallen on 9/11 or take a boat to see Lady Liberty up close and should take into consideration that it’s about a 15 minute cab ride or a 45 minute walk from Battery Park, where the ferry departs for both Ellis and Liberty Islands, to Dos Caminos in SoHo. If you’re on the hunt for a sweet treat after touring lower Manhattan, two top-rated choices are The Donut Pub on the west side and Erin McKenna’s Bakery on the east side. While those with peanut and tree nut allergies can be accommodated at both shops, we hear an occasional concern that Erin McKenna’s uses gluten-free flours processed on equipment that packages hazelnut, almond flours and soy, so the choice is dependent on your comfort level. 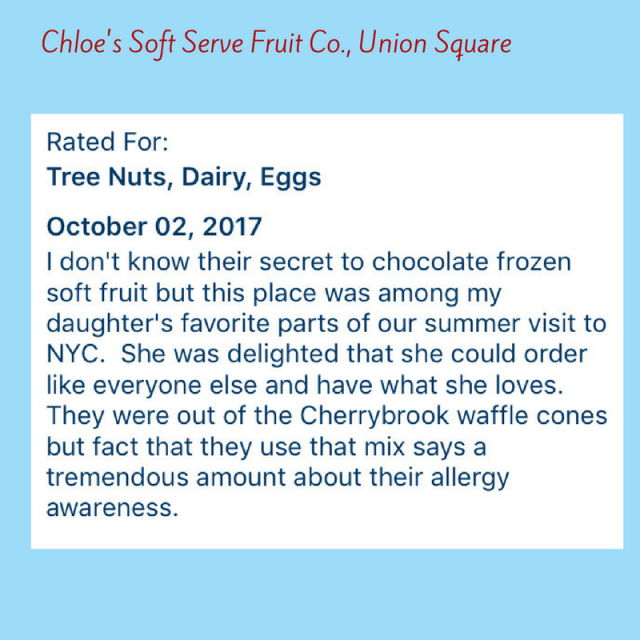 Also note that the majority of The Donut Pub’s reviews on AllergyEats are from diners with tree nut and peanut allergies, who have rewarded it with a near-perfect rating of 4.9. Fun Fact: The pub is open 24/7, so you can easily work it into your schedule, day or night! If you need to burn off some sugar after all those donuts, it’s just a 10 minute walk to one of the entrances to the High Line (Gansevoort and Washington Streets), a 1.45 mile scenic trail that runs along the west side of Manhattan. 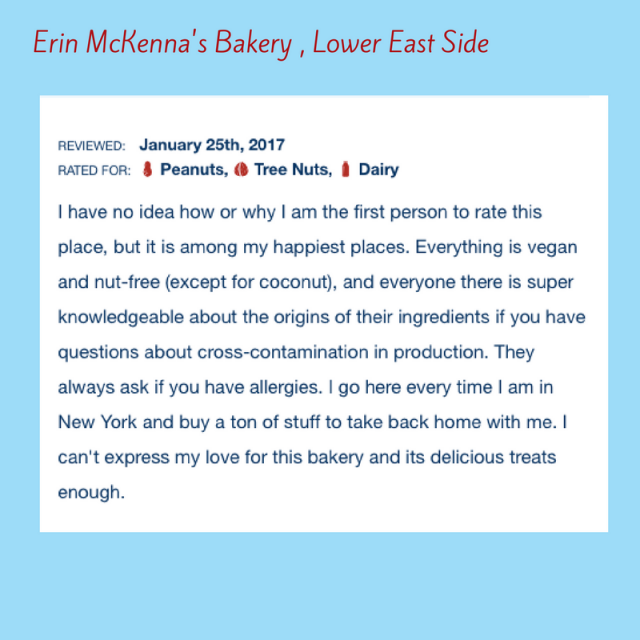 Rest assured, diners who are allergic to egg, dairy, soy and wheat can indulge at Erin McKenna’s entirely gluten-free and vegan bakery, which has a superb rating of 5.0 on AllergyEats! 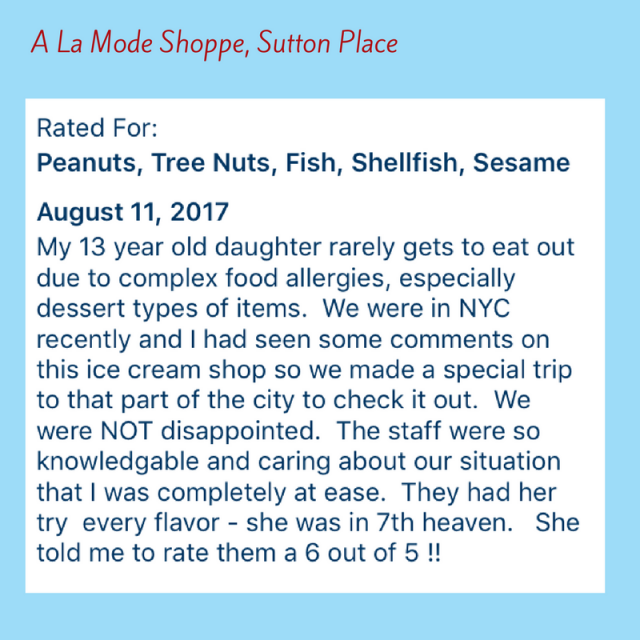 The bakery (originally called Babycakes NYC) also has locations in Los Angeles and at Disney Springs Resort in Orlando and its shops are popular destinations for those in the food allergy community. After your visit to Erin McKenna’s Lower East Side location, another worthwhile destination is the Tenement Museum (103 Orchard Street), where visitors can book a tour to interact with guides who recreate immigrant life in the 19th and 20th centuries. If you’re looking to eat lunch or dinner nearby, The Meatball Shop, one of seven in the city, is just a five minute walk from the museum. The restaurant’s menu is flexible, inviting guests to create their own meals by selecting a type of meatball, sauce and side dish, so food-allergic diners should feel comfortable that the restaurant is accustomed to making dishes based on the guest’s preferences. Of note, pesto is on the menu, the Chicken Balls are gluten-free & pork-free, and the Veggie Balls are vegan. Alternatively, those who’d rather grab a bite to eat on their way back uptown can stop in the West Village at Otto Enoteca Pizzeria. Otto is owned by a restaurant group whose proprietors include celebrity chef Mario Batali and restaurateur Joe Bastianich, and despite its name, the menu extends beyond pizza, making a good choice for diners with a variety of allergies. Looking for one last photo op? 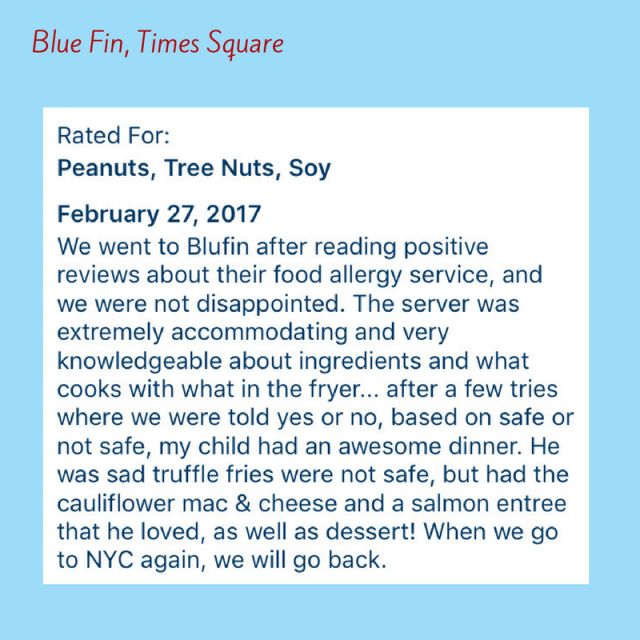 The restaurant is just a two minute walk from one of the city’s most recognized landmarks, Washington Square Arch, located in the park on Fifth Avenue between MacDougal Street and University Place. 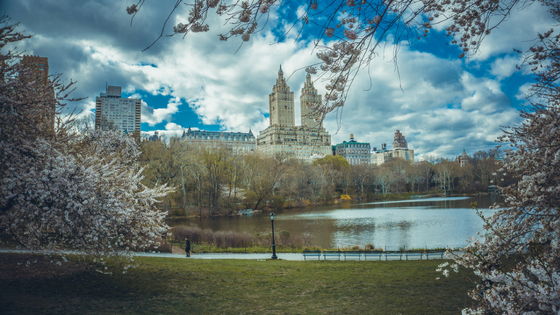 Above 59th Street is where you’ll find popular attractions like Central Park, the American Museum of Natural History, and the “Museum Mile”. This is amazing. Thank you. We are traveling to NY with our Peanut/Treenut allergy daughter for the very first time. Seeing all these options makes me feel so much more comfortable about what to expect when we get there.